Notes: The Skinny Nelson is a pattern designed by Tracy Peterson of Corvallis, Oregon. Tracy developed this pattern on the Bighorn River while guiding in Montana during low flow conditions. He named it after a close friend. Originally, it was tied without a bead and was fished within the skinny waters. The pattern represented small mayflies such as PMD's and Trico's but could also represent any midge hatches that transitioned during the low flow periods. 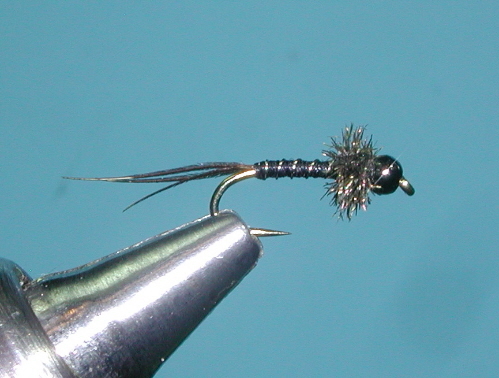 A tungsten bead was added to the pattern so that it could be fished as a traditional dropper nymph beneath a dry fly or as a point fly within a multiple nymph rig. It worked well on other Montana rivers such as the Yellowstone and the Madison. Tracy also found that it worked well on his homewaters of the Deschutes, Metolius, and Crooked Rivers. Tracy was tying over 400 dozen of these flies yearly until Umpqua Feather Merchants picked up the pattern in 2007. The pattern has found success throughout the fly fishing community. Within the Sierra, the pattern is quite popular on the Truckee River. Generally, it is tied in sizes 16-20 to represent small mayflies or midges. The key to this pattern is the thin body profile and the thorax of Peacock Herl. An ultrawire ribbing provides the necessary segentation to the pattern for mimicing mayflies. The thread body can also be tied to a number of colors such as Olive, Purple, Gray, and Brown, although Black is the most popular. As a point fly within a Czech nymphing rig, the pattern can be tied to a jig style hook such as a Tiemco 4640 size 16.